Welcome to Master Electronics, Manufacturer and Supplier of Manual, Battery Operated Stackers and Motor Controllers. The company was incepted in 2006 at Mumbai. Extensive distribution network and Immense domain experience helps us to grab maximum customer satisfaction. Tata Steel Limited, Growel and Wheel are some of our prestigious clients and we are backed by Efficient after sales services and customized solution. We offer a vast range of Material Handling Equipment and Motor Controllers. Our DC Contactors, Battery Connectors and Hand Pallet Trucks are extremely reliable. Counter Balance Mini, LPG and Multi Directional Counter Balance Forklifts are one of the best in the market. We also provide AC, Series and Permanent Magnet Motor Controllers at market leading prices. Our Hour Meters, Input Devices and Electric Stacker for Material Handling are widely demanded in the market. 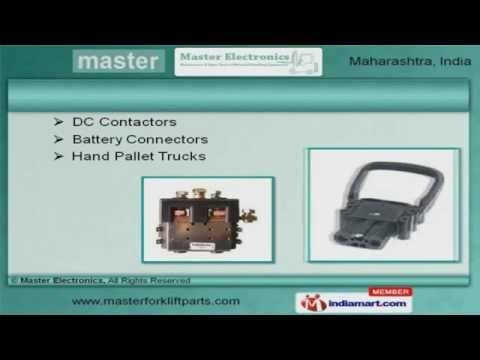 Our clients can avail from us an exquisite range of Battery Connector for Automobile and Hand Pallet Truck for Warehouse.